SHIRLEY ANN MOLLBERG, age 89, of Luverne, died Friday, April 6, 2018, at the Sanford Luverne Hospice Cottage. She was born May 15, 1928, in Chippewa Falls, WI, to John and Dorothy (Woeste) Marthaler. In 1941, Shirley moved with her family to Brooten, MN, where she later graduated from high school and was active in band, drum corps, cheerleading, and many other activities. After graduation, she moved to Luverne and began working at the Rock County Bank. Shirley married Arnie Emil Mollberg on May 12, 1948, at St. Donates Catholic Church in Brooten. The couple lived in Luverne before moving to Centerville, SD, in 1952. In 1955, they moved back to Luverne. She returned to work after her children were in school and worked at First National Bank, Frakes Water Treatment, Nelson Department Store, and the Rock Vet Clinic for sixteen years before retiring in 1990. 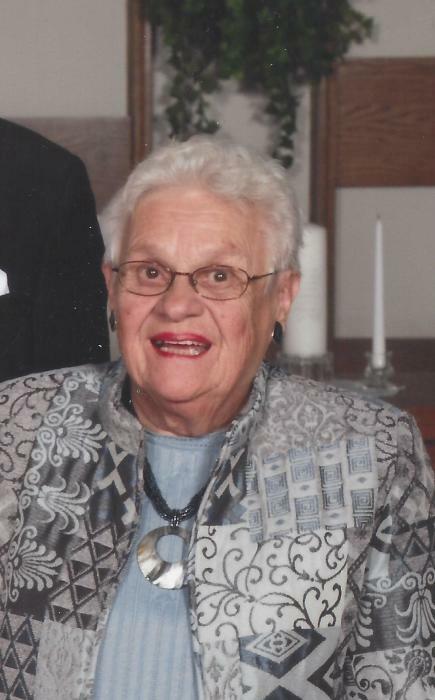 She was a member of St. Catherine Catholic Church in Luverne, the LCCW, charter Eucharistic Adorer, past member of the Luverne Country Club, and the “Sewing Club”. Shirley enjoyed EWTN daily rosary and mass, reading, knitting and crocheting (afghans, Baptismal blankets and caps, doll clothes, Christmas stockings, angels and tree ornaments, and caps for the missions), dancing at the VFW, all sporting events (in person or on the radio), get-togethers with friends, and spending time at the cabin on Lake Sarah. She was known for her potato salad and potato sausage. Shirley is survived by her five children, Diane (Terry) Gonnerman, Luverne; David (Linda) Mollberg, Luverne; Mary (Terry) McDowell, Brandon, SD; Tom (Carol) Mollberg, Sioux Falls, SD; and Linda (Jon) Rust, Rock Rapids, IA; son-in-law, Jeff McClure, Brandon, SD; fourteen grandchildren, Amy (Mark) Overgaard, Mike (Paula) Gonnerman, Heather (Shane) Roberts, Amber (Tim) Walgrave, Jon (Amy) Mollberg, Jodie (Scott) Swain, Jason McDowell, Nicole (Chris) Miner, Erin (Casey) Helbling, Tanner (Cassie) McClure, Marcus Mollberg, Theresa Rust, Andy (Amanda) Rust, and Alex Rust; thirty two great-grandchildren, Matt and Nick Overgaard; Morgan, Levi and McKaya Gonnerman; Kaitlyn, Trey and Tyler Roberts; Meghan Mollberg, Zane and Beck Walgrave; Summer, Hazel and Mavis Mollberg; Bailey, Lauren and Grace Swain; Jacob and Justin Miner; Carson, Max and Emerson Helbling; Blake, Miles and Sidney McClure; Letten Gordon; Cael, Beckett and Luna Rust; and Mace, Brooke and Cole Walgrave; brother, Jack (Liz) Marthaler, Valley City, ND; and sister-in-law, Marge Marthaler, Burnsville, MN. She was preceded in death by her parents; husband, Arnie on November 8, 2003; daughter, Barb McClure on April 26, 2004; an infant grandson, Christopher McClure on August 18, 1973; and a brother, Vernon Marthaler in 2003. Visitation will be from 4-7 pm Tuesday with parish prayers at 6:45 pm, at the Dingmann Funeral Home in Luverne; visitation also one hour prior to the service at the church on Wednesday. Funeral Mass will be 10:30 am Wednesday at St. Catherine Catholic Church, in Luverne, officiated by Fr. Thomas Jennings. Burial will be in the St. Catherine Cemetery in Luverne.